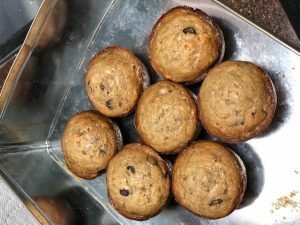 On Monday, March 11th, 3DPT hosted our 3rd annual Muffin Madness contest! We invited employees, patients and friends to stop by and submit 6 of their best muffin creations to be judged on taste, appearance, texture and creativity. Judges tasted every recipe and muffins were also made available for purchase for a charitable donation. 3DPT’s own Jeff Sallade!! Jeff’s banana, chocolate & peanut butter chip muffin topped with a banana cream cheese icing glaze was the crowd favorite this year. The presentation was spectacular and the taste was even better. With all the donations and funds raised by muffin sales, we were able to raise $191, which was matched by 3DPT, for a total of a $382 donation to Jeff’s charities of choice: The Fellowship Alliance Chapel Benevolent fund and the Perinatal bereavement program through the Virtua Foundation! Below is the recipe for the winning Muffin. Our friend and registered dietician, Lynne Nugent from Know it All Nutrition (www.knowitallnutrition.com) suggested a few simple healthy substitutions to cut down on calories and fat (healthy substitutions are in red). Enjoy! Directions: Mix butter and sugar in a Kitchen Aid Mixer. Add eggs one at a time until blended. Add bananas, vanilla and buttermilk and blend. Combine flour, salt, baking soda and cinnamon, then add 1 cup at a time until well blended. Add chocolate and peanut butter chips and mix gently. Bake at 365 degrees for 25-30 minutes, depending on your oven. Insert a toothpick and when it comes out clean, they are done. For the icing: Combine cream cheese, sour cream and butter until smooth. Add remaining ingredients and mix vigorously until smooth. Spread onto cooled muffins.